Organic cane extract, orange fruit crystals, natural orange flavor, vegetable stearine, citric acid and vegetalbe stearate. Children over 2 years of age: Chew 1 bear tablet daily. Consult your physician before using this or any product if your child is taking medication or has a medical condition. Buddy Bear Probiotic is a natural probiotic formula with 1 billion active cultures, including Acidophilus and Bifidus, to help support overall digestive and immune health. Fructooligosaccharide (FOS) helps nourish beneficial flora and maximize bioavailability. 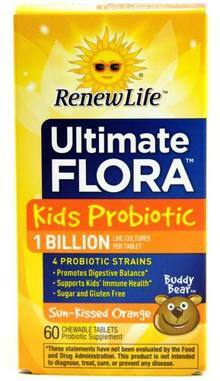 Adults and children over 2 years of age, chew 1 Buddy Bear Probiotic tablet daily. Consult your physician before using this or any other product if you are pregnant, nursing, trying to conceive, taking medication or have a medical condition.